This illustration to the Akbarnama, the history of the reign of the Mughal emperor Akbar, exemplifies Akbar's increasingly spiritual preoccupations from about 1570. His historian, Abu’l Fazl, frequently refers to the disparity between the apparent frivolity of events in the material world, and the metaphysical nature of the emperor’s reflections at the same time. On this occasion he writes of Akbar: ‘in appearance his mind was taken up with the pleasure of hunting; inwardly, there was in his heart the longing to know God’. Akbar had set out with a few servants to shoot wild asses, but became separated from them when he dismounted to follow his prey. He was soon overcome by thirst and weakness in the intense heat, and entered a trance-like condition. His extremely concerned servants eventually found him slumped against his gun, unable to speak. According to Abu’l Fazl, the emperor later felt he had been sent a divine message instructing him to take greater care of himself and to avoid such dangers because of his pre-eminent duty as the guardian of mankind. Akbar’s features have been painted by Keshav, one of a small number of artists accorded the privilege of doing portraits of the emperor and leading figures of the court, while the rest of the composition by an unknown designer has been painted by Mohesh. The Akbarnama was commissioned by Akbar in 1589 as the official chronicle of his reign. It was written in Persian by his court historian and biographer, Abu'l Fazl, between 1590 and 1596. It was illustrated simultaneously by artists from Akbar's ketabkhana, or "House of Books", where manuscripts were stored as well as created. After Akbar's death in 1605, the manuscript remained in the library of his son, Jahangir (r. 1605-1627) and later Shah Jahan (r.1628-1658). The Victoria and Albert Museum purchased it in 1896 from Mrs Frances Clarke, the widow of Major-General John Clarke, who bought it in India while serving as Commissioner of Oudh between 1858 and 1862. 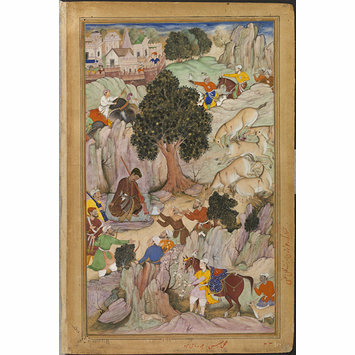 Painting, in opaque watercolour and gold on paper, Akbar hunting wild asses in the desert. 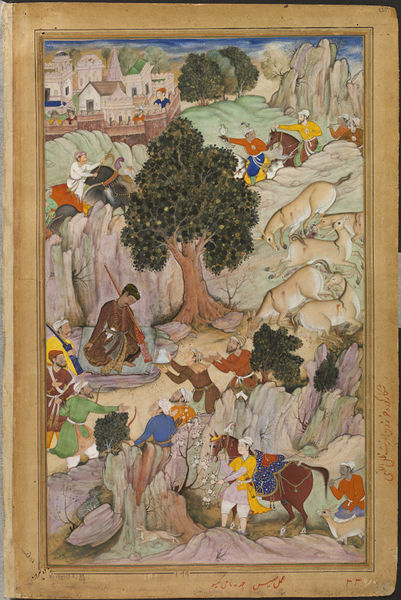 Akbar is shown seated and withdrawn in a clearing. On the right, corpses of wild asses lie on the ground near a tree. These are contemporary attributions in Persian, written in red ink in the margin below the picture. The Akbarnama was commissioned by the Mughal emperor Akbar in 1589 as the official chronicle of his reign. It was written by his court historian and biographer Abu'l Fazl between 1590 and 1596, and illustrated by at least forty-nine different artists from Akbar's studio between about 1590 and 1595. After Akbar's death, the manuscript remained in the library of his son, Jahangir. The Victoria and Albert Museum purchased it in 1896 from Mrs Frances Clarke, the widow of Major-General Clarke, who bought it in India while serving as Commissioner in Oudh province from 1858 to 1862. Calza, Gian Carlo (ed.) Akbar: the great emperor of India. Rome : Fondazione, Roma Museo, 2012. ISBN 978-88-572-1525-9 (hard cover edition); ISBN 978-88-572-1793-2 (soft cover edition). p.266 , cat. no.V.1. Composition by Mahesh, portraits by Kesav.